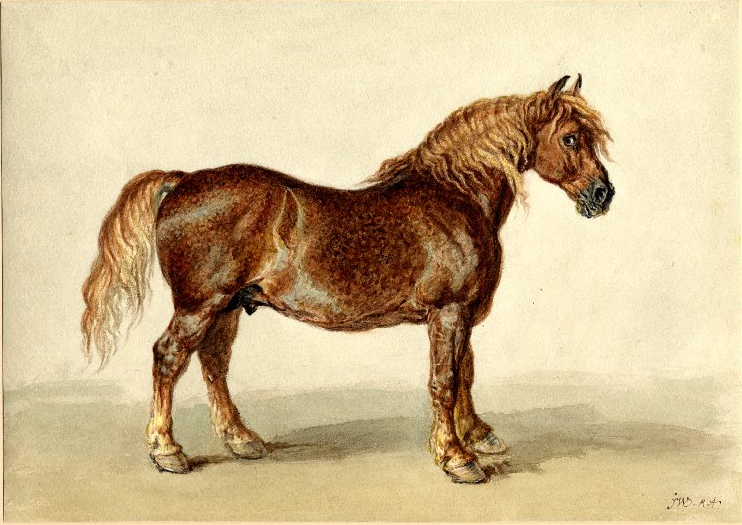 A Cart-horse, by James Ward, R.A. Courtesy of the British Museum, London, via Wiki Commons. Among all the sights of the docks, the noble truck-horses are not the least striking to a stranger. They are large and powerful brutes, with such sleek and glossy coats, that they look as if brushed and put on by a valet every morning. They march with a slow and stately step, lifting their ponderous hoofs like royal Siam elephants. Thou shalt not lay stripes upon these Roman citizens; for their docility is such, they are guided without rein or lash; they go or come, halt or march on, at a whisper. So grave, dignified, gentlemanly, and courteous did these fine truck-horses look – so full of calm intelligence and sagacity, that often I endeavored to get into conversation with them, as they stood in contemplative attitudes while their loads were preparing. But all I could get from them was the mere recognition of a friendly neigh; though I would stake much upon it that, could I have spoken in their language, I would have derived from them a good deal of valuable information touching the docks, where they passed the whole of their dignified lives. Talking Horses: Honhy, Honhy, Hon! A Victorian Policeman is Saluted. 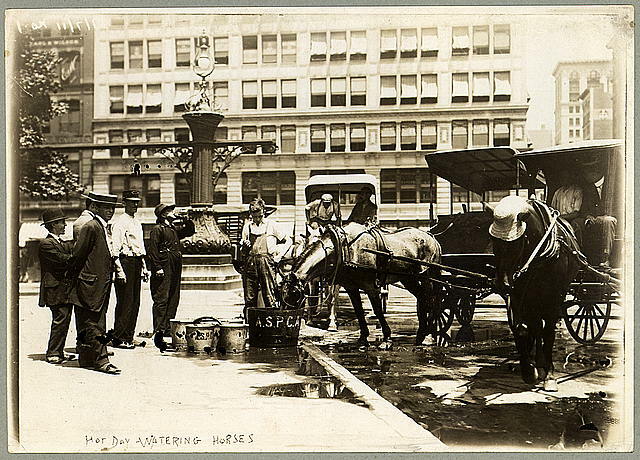 Street-cab horses drinking from half-barrel of water provided by the A.S.P.C.A. George Grantham Bain Collection (Library of Congress). 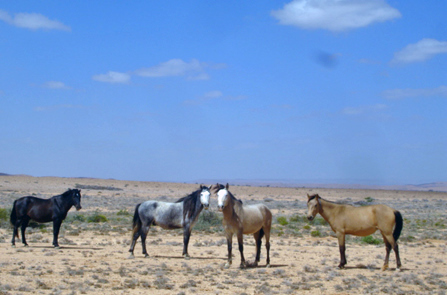 Note hat on right-hand horse. In his 29-year career as a policeman in Victorian London, John Pegg oversaw over 1,300 convictions for cruelty to horses. This poem was written “on behalf” of those horses by George H Hutt in 1892. Read more about Hutt – “the police poet” – and Pegg here, along with a collection of other “horses’ letters” on Christopher T George’s ripperology blog. While others pass it by. Yours kindly took its place. We’ve struggled on in pain. Have urged on to work. Left me, unclean, to fast. While Sangster set me right. By finding out the flaw. A moral we can teach. Old age is sometimes majestic, sometimes ugly, and sometimes pathetic. But old age can be both ugly and majestic, and the gelding’s old age was just of that kind. His forelegs were crooked to a bow at the knees, there were swellings over both hoofs, and on one leg, on which the piebald spot reached half-way down, there was a swelling at the knee as big as a fist. 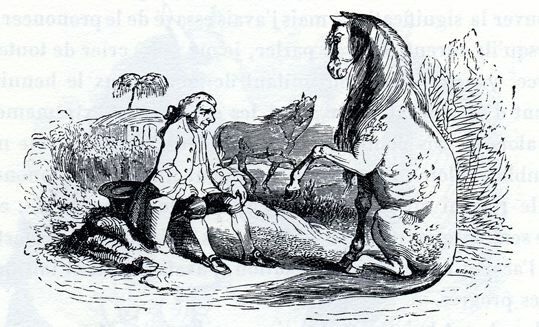 The hind legs were in better condition, but apparently long ago his haunches had been so rubbed that in places the hair would not grow again. The leanness of his body made all four legs look disproportionately long. The ribs, though straight, were so exposed and the skin so tightly drawn over them, that it seemed to have dried fast to the spaces between. His back and withers were covered with marks of old lashings, and there was a fresh sore behind, still swollen and festering; the black dock of his tail, which showed the vertebrae, hung down long and almost bare. On his dark-brown croup – near the tail – was a scar, as though of a bite, the size of a man’s hand and covered with white hair. Another scarred sore was visible on one of his shoulders. His tail and hocks were dirty because of chronic bowel troubles. The hair on the whole body, though short, stood out straight. Yet in spite of the hideous old age of this horse one involuntarily paused to reflect when one saw him, and an expert would have said at once that he had been a remarkably fine horse in his day. The expert would even have said that there was only one breed in Russia that could furnish such breadth of bone, such immense knees, such hoofs, such slender cannons, such a well-shaped neck, and above all such a skull, such eyes – large, black, and clear – and such a thoroughbred network of veins on head and neck, and such delicate skin and hair. There was really something majestic in that horse’s figure and in the terrible union in him of repulsive indications of decrepitude, emphasized by the motley colour of his hair, and his manner which expressed the self-confidence and calm assurance that go with beauty and strength. Like a living ruin he stood alone in the midst of the dewy meadow, while not far from him could be heard the tramping, snorting and youthful neighing and whinnying of the scattered herd. If you are in New York the Bolshoi Puppet Theatre will be giving a performance of Kholstomer at the Baryshnikov Arts Theater from 18th to 20th October. Looks absolutely wonderful! O Men of God, tell me if, in making this claim, I have committed an error! “Guulside, or the Victory Bearer” by Ali Bu’ul, translated by Said Sheikh Samatar. My horse saves me from these dangers. And showers you with holy scriptures. “A Horse Beyond Compare” by Raage Ugaas, translated by Said Sheikh Samatar. Is he an inheritance from blessed heaven!? Is he not my very heart! 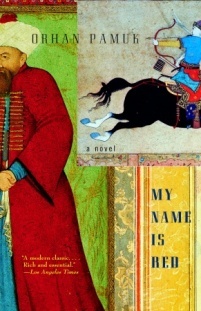 “A Fine War Horse” by Sayyid Mahammad, translated by Said Sheikh Samatar.